Helena is a 1924 German silent drama film directed by Manfred Noa and starring Edy Darclea, Vladimir Gajdarov and Albert Steinrück. "Helena; Der Untergang Trojas" (1923/24) is a free adaptation of Homer's work "The Iliad". It was kept practically in oblivion until an almost complete copy was found in Lausanne, Switzerland (that European country so amusing for Teutonic aristocrats). This copy was completed with several materials available from other forgotten copies in the archives of Rome, Madrid and Moscow. Due to all this material and research, a reconstruction, very close to the original, has been possible. It was made by the "FilmMuseum München". It is another major effort of silent film restoration because in this case they kept the tints used in the original film. All this provided a unique opportunity for the world of silent movie fans to appreciate this German super production after it suffered through 80 years of neglect. Herr Manfred Noa (1893-1930) was originally an architect but then embarked on a short but fruitful career as a director in Berlin. He started as a set designer in many Germanic productions until he was "discovered" by the great German director Herr Richard Oswald (who directed among others, the unclassifiable and fascinating "Unheimliche Geschichten" (1919) and "Alraune" (1930)). Oswald acted as Herr Noa's mentor and Noa finally had an opportunity to direct his first film "Bobby Als Amor" in 1916. His meticulous adaptation of Homer's masterpiece brought his production company, Bavarian Films, to bankruptcy and the film was unable to recoup the enormous production costs. It was released at almost the same time as Fritz Lang's "Die Nibelungen" (1924), a great epic that deserves its place of honor in cinema history. However, it is unjust that "Helene", which shares some of the qualities of the Lang film, had such small support from a public who enjoyed these monumental films. Herr Manfred Noa, was Jewish and had to suffer the anti-Semitism that was so common in Germany at that time. Noa's earlier film "Nathan, Der Weise" (1922), a plea for tolerance between different religions, had to be withdrawn from the cinema because of threats that were made barely a day after its premiere in Munich. Of course the situation was doomed to get worse as the Nazis gained in influence. Noa died prematurely in 1930 and both his life and his work stayed in oblivion until the recent discovery and excellent restoration of "Helena". 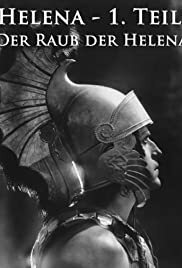 "Helena" is the only German film version of the Troy legend; certainly doing an adaptation of such a work was a very arduous and unenviable task but it was put in the capable hands of playwright Herr Hans Kyser. The movie was divided into two parts, "Der Raub Der Helena" ( The Abduction Of Helen ) and "Der Untergang Trojas" ( The Ruin Of Troy ). It's a titanic, surprising and majestic effort, technically impeccable and with extremely careful production design. The theatricality, magnificent locations, great set design and countless extras naturally bring to mind "Cabiria", that super production that influenced so many, especially Herr Griffith. "Helena" is a big, kolossal film worthy of the adjectives usually heaped upon such an epic. It also has an eye for realistic historical detail and striking costume design (done by Herr Walter Wessener). The film's special effects are outstanding especially in the premonitions and dream sequences which are atmospheric and ingeniously done. Obviously in this adaptation of Homer's work, special care has to be taken for the big battles and crowds and the hordes of extras, especially when the city of Troy is under siege. The coordination of these elements can be difficult, even for the disciplined German mind. Not all of the spectacular sequences are as good as they could be; surely the chariot race does not compare to the one in Fred Niblo's "Ben-Hur" (1925). It is actually "static" and without the beauty and emotion of Herr Niblo's excellent film. However, "Helena" makes up for it to some extent in the naval battle where the chaos produced by the ships, smoke and fire manage to recreate perfectly that emotional conflict between Greeks and Trojans. The film's principal actors, although not very well known, performed their characters in a proper manner, without falling into excessive mannerisms that one sometimes sees in these pioneer productions. It is important to mention Herr Carl de Vogt, one of the biggest German stars of those times who had already performed in four of Herr Fritz Lang's films. He plays Hektor in "Helena". The film's numerous merits demonstrate the unfairness of "Helena" and its director Herr Manfred Noa being so little known. We have to be grateful for these modern restoration jobs of old nitrates. And now, if you'll allow me, I must temporarily take my leave because this German Count has just received an agreeable present from the Schloss' servants: a big wooden horse.